Scanned a serialized container and realized that one of your serialized components needs swapping out? Use the swap component option to do just that. From the opportunity detail view, hit the blue arrow to the right of a serialized component and choose swap component from the menu. Don’t see the option to swap? Swap component is only available for serialized components, i.e. components within a serialized container. On the swap component pop-up box, scan another asset or type its asset number in the “swap for new asset” box to allocate that asset to this opportunity in place of the original. The new asset doesn’t need to be the same product that was swapped out. It must be serialized; you can’t swap for a bulk or non-stock level. The serialized container is automatically updated with this new configuration: the swapped out asset is removed and the swapped in component is added. If the serialized container has been booked out on another opportunity in future, that opportunity will be adjusted to include the new component too. You’ll receive a warning letting you know that this has happened. 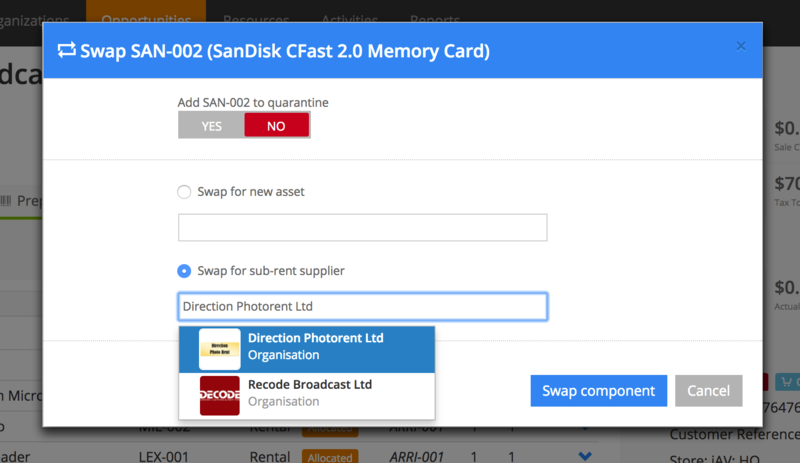 On the swap component pop-up box, choose the “swap for sub-rent supplier” button and start typing the name of an organization in People & Organizations to specify as a sub-rent supplier. If you like, you can quarantine the serialized component that you’re swapping out. Toggle the add to quarantine slider to YES.